GEOMAGNETIC STORM: A coronal mass ejection hit Earth's magnetic field at approximately 12:30 UT on April 11th. The impact sparked a G2-class geomagnetic storm with auroras over Scandinavia, Scotland, Canada and northern-tier US states such as Maine, Michigan and Wisconsin. "Vertical rays of green light shot as high as 20o above the horizon," says McKenna. "Quite a show!" And it may not be over. The interplanetary magnetic field (IMF) near Earth is pointing south, an orientation that favors strong geomagnetic activity. 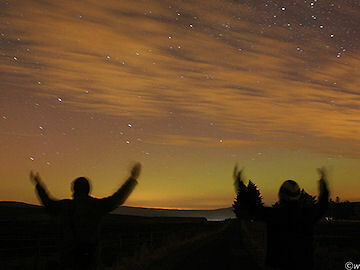 High-latitude sky watchers should remain alert for auroras tonight. The comet was probably a member of the Kreutz sungrazer family. Named after a 19th century German astronomer who studied them in detail, Kreutz sungrazers are fragments from the breakup of a giant comet at least 2000 years ago. Several of these fragments pass by the sun and disintegrate every day. Most are too small to see but occasionally a big fragment like today's attracts attention. This has been an active year for big, bright sungrazers. There was one on Jan. 4th, another on March 12th, and the latest on April 10th. Normally we see no more than 3 or 4 bright ones in a whole year; now we're seeing them almost once a month. It could be a statistical fluctuation or, maybe, a swarm of Kreutz fragments is nearing perihelion (closest approach to the sun). Stay tuned for doomed comets! On April 12, 2010 there were 1117 potentially hazardous asteroids.